I doubled this recipe to make enough for our crew +1 and some for leftovers today. Fry them up in a pan with coconut oil til crispy on each side. Once cooked you can place on a plate with a dishtowel or paper towel to absorb any excess oils. 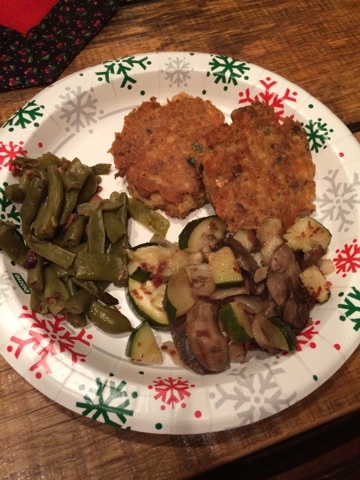 Great, yummy, S meal with green beans and a vegetable medley of onion, zucchini, and mushrooms. I need to make these. Yours look good!